Soooo pretty, you'll just want to reach out and pet this lovely lop eared rabbit. Available in 1 1/4" or 7/8" sizes. Use pull down menu below to make your selection. Super easy to paint. Beautifully finished, high resolution 3D print from our new resin printer. Ready to paint using acrylic paints. 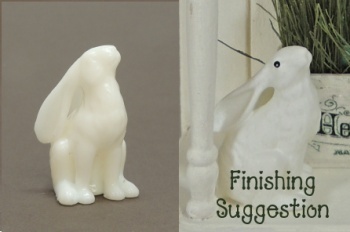 Figure is white as shown on left, painted version on right is just a sample of how this piece could be finished.